July 16th, 2015 – The first six months of 2015 were cooler than the same period of 2014 in the main Western European Countries. This fact, together with the economic growth, entailed a year-on-year increase of the electricity consumption in countries like Italy, France and Spain. In Great Britain, where temperatures are usually lower, there was not this increase. 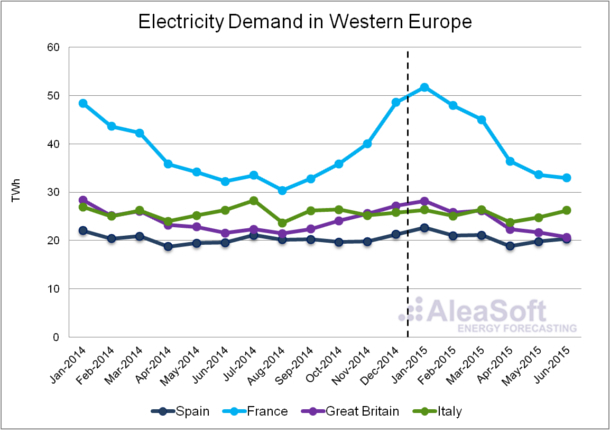 Evolution of the monthly electricity demand in Western Europe -2014 and the first half of 2015- (TWh). During the first half of 2015 the electricity demand in Spain was 1.9% higher than in the same period of 2014. According to REE (Red Eléctrica de España), if the effect of working days and temperature were taken into account, this increase would be 0.5%. This remaining increase can be explained by a growth of the economic activity, represented by a year-on-year GDP variation of +2.7% in the first quarter. The electricity consumption in France during the first six months of 2015 grew by 4.7% on a year-on-year basis. This is due to the lower temperatures and the GDP growth (0.8% in the first quarter). During the first six months of 2015, the electricity consumption in Italy was only 0.2% greater than in the same period of the previous year. A small variation of the GDP (+0.1% in the first quarter) and the slightly lower temperatures contributed to this fact. A growth of the economic activity is expected in the analyzed countries during the second half of 2015. 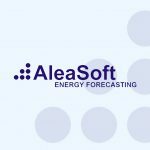 AleaSoft’s forecasts indicate a generalized increase of the electricity consumption compared to the second half of 2014. Such forecasts assume that temperatures will take historical average values. They also consider different growing scenarios for the GDP during the year 2015 compared with 2014. A greater demand is expected in Spain, according to a scenario of GDP growth of 3.1% in 2015. 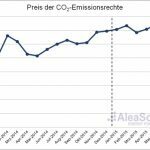 The electricity consumption in France will be higher in France during the second half of 2015 compared to the same period of the previous year, according to AleaSoft’s forecasts. These forecasts assume that the GDP will grow by 1.2%. The electricity demand in Great Britain is expected to grow, considering a growing GDP scenario of 2.4% in 2015. In Italy, considering a GDP growth of 0.7%, a slight year-on-year increment of electricity consumption is expected during the second half of 2015.